Don’t the words just sound like they’re meant to be together? Honey Flow. Yummy. If you’ve been talking to me lately, you know that I won’t shut up about the honey flow. So what is it? This entry was posted in Honeybees on July 31, 2013 by skinny_jake. July is a great month to be a bee. This is the time of year that beekeepers refer to as the honeyflow. This is when flowers are in full bloom, nectar is abundant and the air is full of the sweet aroma of summer. Bees will make dozens of trips into the urban jungle each day, visiting their favorite nectar sources. They will deposit the nectar in the wax comb where it will eventually become honey. They will also tell their sisters where they found the nectar, enticing them to join in on the bounty. July is also hot. Hotter than a billy goat in a pepper patch. When the humidity rises with the temperature, bees will instinctively ventilate their hive. Incredibly, they line up in front of their hive entrance and beat their wings, creating a powerful breeze that flows through the stacks of honeycomb. To improve ventilation on particularly hot days, thousands of bees will step outside the hive to create more room and to reduce heat build-up. This is called bearding. It is a natural and normal thing for bees to do. It does not indicate overcrowding or swarming, though it can look alarming the first time you notice it. If you see bees covering your hive on a hot day, think cool thoughts and watch them do what they do best: make honey. This entry was posted in Hive Hosts, Honeybees on July 9, 2013 by skinny_jake. It’s good to be a bee in May. Temps are warming up, the queen is laying eggs, and even though you may not see a lot of blooms, the bees are finding them. During the early evenings, you may notice bees like the one in this picture with little dots of yellow and gold on their hind legs. Honeybees are equipped with pollen baskets on these appendages. 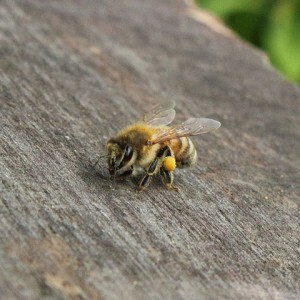 Pollen is extremely important for bees in the early spring. Pollen is their protein source. It gives them strength and is also what they feed the developing larvae. Without pollen, their sisters-to-be will perish. Take a few moments on a nice day to get close to the hive entrance and watch as bees laden with pollen return home. It is fascinating to see the different hues of yellow, gold and orange pollen that they find. This entry was posted in Hive Hosts, Honeybees on May 2, 2013 by skinny_jake. Spring is glorious. It is also like a baseball bat to the face for allergy sufferers. Luckily Big Pharma has made it easy for you to take Allegra, Benadryl, Claritin, Chlor-Trimeton, Dimetane, Zyrtec, Tavist, Ocu-Hist, Clarinex, Xyzal, Astelin, Patanol, Elestat or Optivar to help you find minor, temporary relief. Luckily these medications are also very expensive, to help you convince yourself of their effectiveness. Unfortunately, the alternative is an affordable, natural, delicious way to help your body form a robust resistance to allergies. It boosts the health of your entire immune system and tastes like candy for the gods. If that wasn’t bad enough, buying it from a local source helps support the local economy and supports a systematic network that improves the environment and the food system that we rely on to live. This entry was posted in Recipes on April 5, 2013 by skinny_jake. I will use the honeybee management timeline provided by the University of Minnesota’s Department of Entomology, which includes schedules for feeding syrup and pollen, hive reversals, and upkeep. I plan to provide three brood boxes (deeps) for the hive, beginning with one and adding additional boxes as the hive grows. I will install a 2-lb. package of bees to start my colony, feeding them syrup and pollen until sufficient nectar can be collected. I will perform upkeep on the hive every 7 to 10 days, observing the population of the hive, monitoring any diseases or pests (including varroa mites and AFB), and assessing the strength of the hive. Once the brood boxes are fully drawn out and inhabited by bees, I will monitor the location of the queen, performing reversals of the brood boxes. The queen-occupied brood box will be moved to the bottom of the hive, ensuring that she is constantly moving upward. This method will ensure that the queen does not run out of room to lay eggs and that the brood boxes will be evenly populated, preventing crowding, which can lead to swarming. My hive will consist of three painted brood boxes and additional painted honey supers (medium supers), an inner cover and a telescoping outer cover. 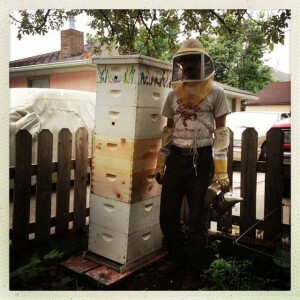 My hive will be placed on sturdy, level cinder blocks and rest on a painted, well-constructed hive stand. I will destroy any equipment that I suspect or have concluded contains AFB spores, and I will replace it with new equipment. During upkeep, I will remove any queen cells, should I observe them. I have low VOC, white latex paint on hand to paint any new equipment that I acquire, and to paint over any repairs I make to the hive. I have a shed dedicated to storing my bee equipment, protecting it from robbing, mice and pests. I will take these steps to keep a strong, healthy, clean hive that can defend itself from intruders, fend off diseases and pests and produce healthy brood while storing nectar and pollen and creating honey stores. I plan to winter my hive in early November in three deep brood boxes dedicated to storing honey solely for the survival of the colony. My wintered hive will be covered with a black box, the opening of which will match the 1-inch opening on the side of the hive. 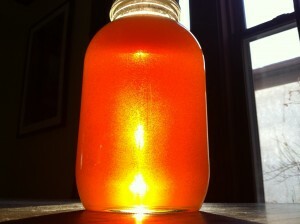 The following spring, I will feed my hive syrup and pollen until sufficient nectar can be gathered. 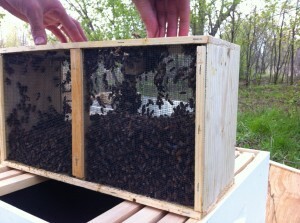 I will harvest honey from medium supers off-site at my father-in-law’s property in Spicer, Minnesota. 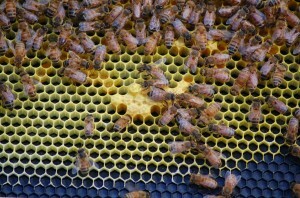 I will use a queen excluder during high honey production to ensure that my supers contain cells filled with only honey. I have a capping knife, a 4-frame honey extractor and glass jars available to extract and store the honey. I will label the honey in compliance with Minnesota state law, assuring that it contains no more than 18.6% moisture content. I will filter the honey before bottling it to ensure it is clean and free of foreign debris. This entry was posted in Hive Hosts on March 27, 2013 by skinny_jake. New charcoal Ts are in! Order yours today for $20. 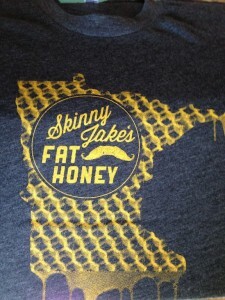 Send an email with your size and address to: honey@skinnyjakesfathoney.com. This entry was posted in Honeybees on March 27, 2013 by skinny_jake. I’ve been wondering when this would happen: a long, drawn-out, cold and bitter end of winter. Weather has been merciful to me since I began beekeeping. Now the chickens are coming home to roost. March is going out like a lion. 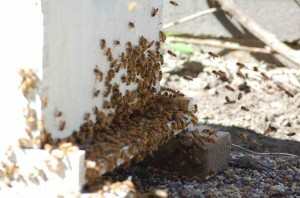 Late winter/early spring is a crucial time for honeybees in northern climes. They have reached the end of their honey stores and have the added challenge of keeping early brood warm. If the weather is average, beekeepers can easily supplement the bees with extra honey or pollen patties. 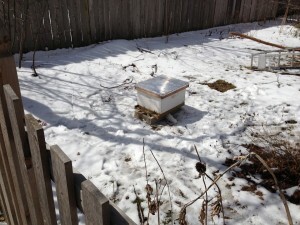 This year the cold north wind and late season snow has made it difficult to get into the hives. Of our 20 hives, I suspect half will survive. I’ve ordered packages of carniolans to supplement our lost hives and am excited to install them in April. I’ve been working with some wonderful Minneapolitans this winter who are willing to host hives in their backyards. The permit process has been going since January. As each hive finds a new backyard home, Minneapolis becomes more of an awesome urban jungle. This entry was posted in Honeybees on March 20, 2013 by skinny_jake. For those of you who are sending in your applications, I have included a link to a scanned copy of my University of Minnesota Department of Entymology Honeybee Certificate. You can print it and send it with your application materials. This entry was posted in Hive Hosts on March 19, 2013 by skinny_jake. The bees, my friends, are coming. I’m planning on installing new hives the first week of April. Hopefully you’ve received your permit application packet from the city and have been gathering signatures from your neighbors. If you need talking points, read through the bee letter I posted last month. Many of you have been contacting me about fly-away barriers. The city wants to make sure that if you are within 25 to 35 feet of your property line that your honeybees won’t fly directly into your neighbor’s yard. A bush, a garage, a tree or a fence all act as a fly-away barrier. This entry was posted in Hive Hosts on March 8, 2013 by skinny_jake.